Mini Paris Brest Pastries from Duchess Bake Shop. 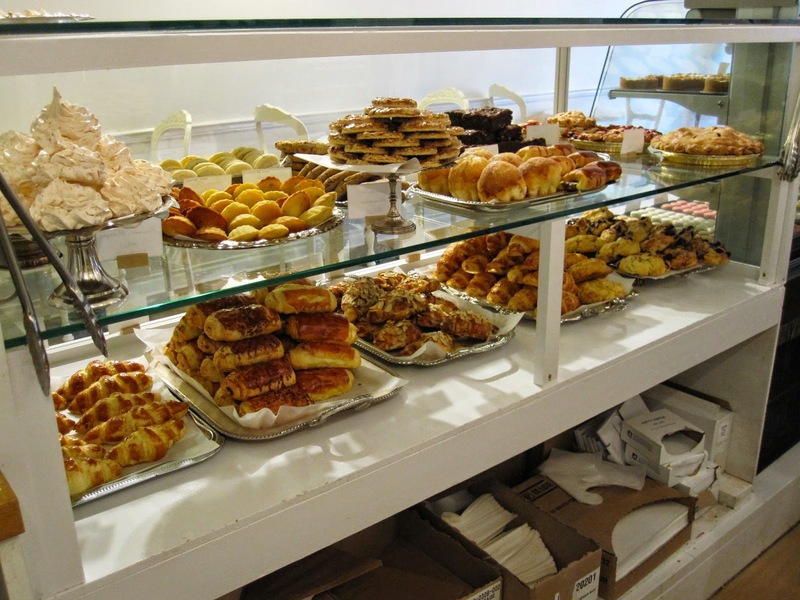 Duchess Bake Shop is our favourite place for fine French baked goods and pastries in Edmonton. Dan and I have visited since Duchess opened, and have brought many friends, family, and out of town guests for a taste of France in Edmonton. 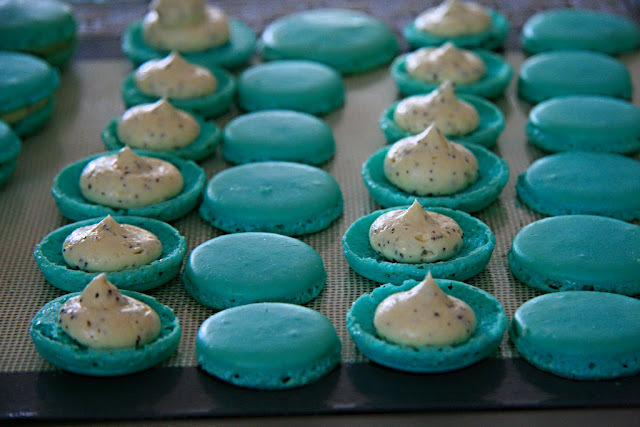 Back in 2009, Dan and I had been attempting unsuccessfully to make macarons in my small galley kitchen. When Duchess opened in October 2009 to great fanfare, we were very keen on visiting specifically because of their macarons. We learned that one of the owners, Giselle, had become fascinated with macarons while in Japan and had spent time perfecting the homemade macaron. This inspired me in my pursuit of the elusive homemade macaron. If you've followed along in my journey, you would definitely see all the different macarons I've baked. Even though we visited Duchess many times over the following months, it played a special part during a memorable day in May of 2010. We were invited to an exclusive behind-the-scenes look at what happens in the kitchen before the doors opened. Little did I know that the invitation was just part of a series of special surprises Dan had planned before he proposed to me! Behind the scenes in Duchess' kitchen in May 2010. As many of you may have heard, Duchess released their self-titled cookbook last Wednesday (November 12, 2014). This cookbook resonates with me not only because there are beautiful pictures accompanying the step-by-step instructions, but also, this is the first cookbook where I've tried every item! A tower of croquembouche at the cookbook launch! Giselle Courteau at the Duchess Bake Shop cookbook launch. Giselle has generously given two signed copies of Duchess' cookbook as a giveaway for two lucky readers! This giveaway is only open to readers who live in and around Edmonton or in Calgary. If the winner(s) resides in Calgary or area you must be able to meet with me in Calgary on either Saturday November 29, 2014 or on Sunday November 30, 2014. Arrangements will be made if the winner(s) live in Edmonton or greater area. You can also purchase their cookbook in Edmonton at Provisions or online. Good luck to everyone and I look forward to reading your bake shop memories. My first time at Duchess I ordered macarons, madeleines and hot chocolate. I sat at a little table by myself and was transported to France with my first bite. I was hooked. I wouldn't even know which recipe to begin with- they all sound lovely! Perhaps the mille-feuille? I remember going to a bakery with my grandma when I was a little girl. I don't remember which bakery it was, but the displays were so big and filled to the top with all sorts of tasty looking things! The Duke is my favourite Duchess treat so I would make that first! Fav memory is definitely going to Duchess for the first time. Just fell in love with everything! Definitely would try making the mille-feuille or lemon meringue cake first!! I will always remember visiting my first patisserie in Paris and how in awe I was! I tried a different pastry each day I was there :) I was so excited when the Duchess opened here and my sister & I have made it a tradition to spoil ourselves with Duchess treats on our birthdays! I think my favourite memory of going into any bakeshop is when the door first opens and I get that first rush of sugar filled air rushing up my nose. Yeah, I guess I'm a sugar junkie! The first recipe I would bake would have to be the lemon meringue cake! It's all the yummy desserts in Asia. I am going back next week and can't wait to admire them. That bake shop looks lovely! Doesn't that croquembouche look fantastic? The structural integrity of them always impresses me. We've had a couple lovely brunch/lunches at Duchess on lazy Saturday mornings. Definitely a great start to the weekend and a tradition I wouldn't mind starting if our pocket books could afford it every week! If I won the cookbook, I'd need to start with something simple. I think it would be hard to screw up shortbread and Duchess makes some lovely varieties! yes! I love their madeleines as well. The atmosphere of Duchess transports me to France each and every single time! oooh flully buttercream cakes?? Does this bakery still exist today? Yes! there are almost 80-90 recipes in the cookbook and madeleines are definitely in there! I ended up purchasing 2 madeleine pans since you will certainly need at least 2 for making madeleines. Usually the batter I use makes about 3 pan batches worth. I haven't tried making the one of the duchess one yet. mm..yes! as a child everything seems so amazing and big from our perspective! I remember visiting many bakeries with my grandmother too. yup that is in the cookbook for sure! I know! It is so hard not to pick up every single item! At least with the cookbook you could try your hand at making some of them! mm..yes Duchess certainly has my heart! I try very hard not to stop by sometimes on the way home from work when I am downtown. I love the almond croissants. B, I am sooo sugar addictive as well. Every time I am in Calgary I make my morning visit to Sidewalk Citizen bakery (their south one) and love the smells as I walk in. oooh my, so heavenly. ahh..that must be an awesome moment!! ooh yes! Make sure you take lots of pictures and savour every morsel. Which cities will you be going to? I always find Japan has such amazing delicate treats. The newest item out there in asia now are these clear like mochis! look them up! They are very interesting. Sometimes they call them "unicorn tears". It is a beautiful bakeshop Shareba. I do still miss the bakeshops in Toronto. Everytime I go home I make a visit to Nadege! Yes! They did such a great job with the croquembouche. I really wanted to try a piece right away but I was there at the beginning of the night, so I didn't want to be the first to take a crack at it! I would agree that Duchess is great for saturday brunches/lunches. Sometimes, I go on a sunday afternoon around 3pm (the crowds tend to subside by then) and read books with my hubby over pastries and tea. Certainly agree that it is not an every sunday occasion. Shortbread would be a great place to start! oh! 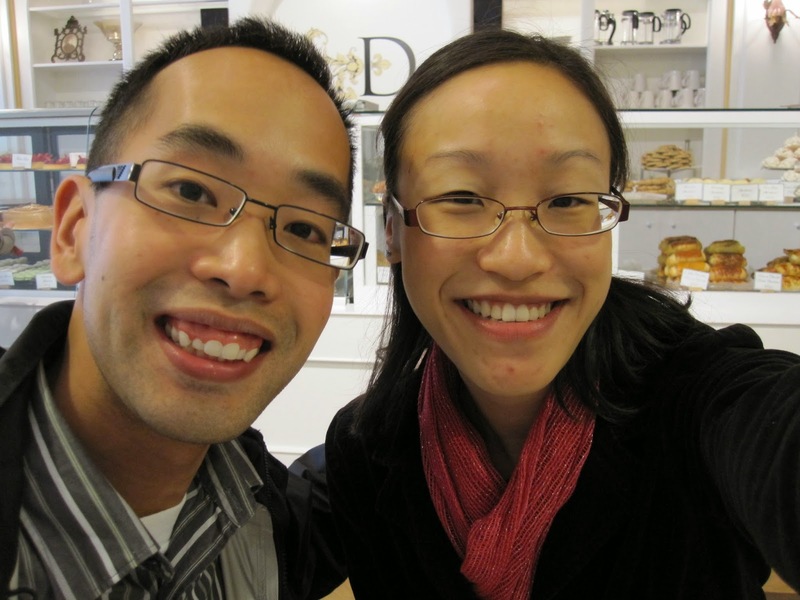 We didn't have a chance to go to Tartine the last time we were in SFO. We do, however, have their bread book and Dan loves it! He bakes from it all the time! Bakeries are the perfect activity to do on a lazy saturday or sunday afternoon. I often find that it has the best atmosphere for such activities. good luck and thanks for visiting. Yes! The Tart Montreal is in the book. I love the crunchy praline at the bottom. yes the mille-feuille is in the cookbook! There are step by step instructions in the book with accompanying photos. Giselle did say that every recipe is written just like how they make it in the kitchen. Both are in the book! Get your blow torch ready and pastry making skills out! the cookbook does go through things step by step. Giselle said that she wrote each recipe exactly to how they make it in the kitchen. Let me know the next time you're in and I'll meet you there! 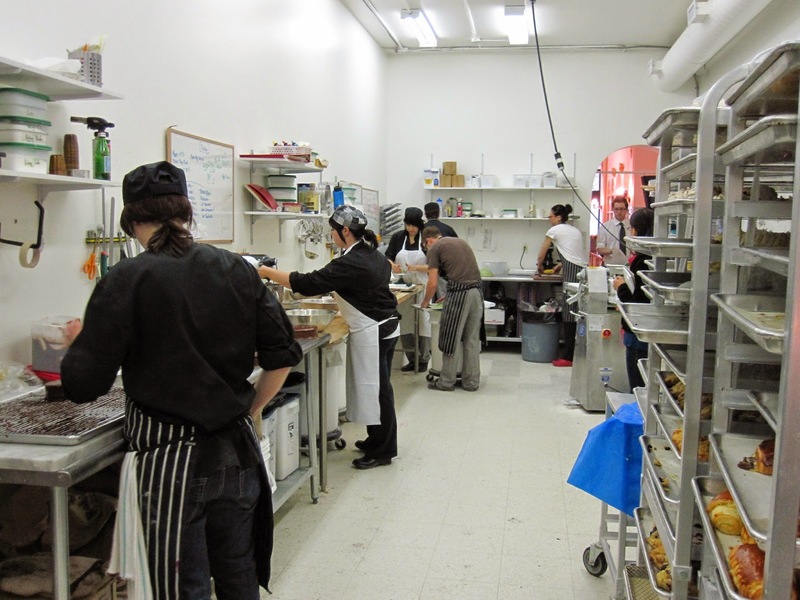 The best part of a bakeshop - in particular Duchess - is the joy that resonates in those walls. These are people that love sharing their culinary gifts with the world - making my taste buds and I ever so grateful! Every time I go to Duchess,it brings back sweet memories of my short time in Paris. A true delight for the city of Edmonton. My favourite memories of bake shops are stumbling upon them. We came across one on Salt Spring Island that we stopped at every day during our vacation for beautiful patisseries to keep us going! My favourite bakeshop memory has to be going in to the small town bakery where I grew up before it opened. My dad was friends with the baker, and used to visit before the stores opened in the morning. When I went to work with him on Saturdays it was awesome. Like stepping into Santa's workshop! My favourite bakeshop memory is going to Tartine in San Francisco. I enjoyed their bread and morning bun the best. Soooo good! Thankful to have Duchess here to enjoy with their beautiful and delicious treats. My earliest memory of going into a bake shop has to be the smell of bread/bake goods. To this day, I still love that smell! If they have the recipe for the florentines, I will most definitely make that first! yes! So true Jenn! I love the ambience that vibrates within places like Duchess. So many amazing creations that come from them. The amazing thing is that when Duchess first opened their kitchen (picture above) wasn't small but wasn't huge either. 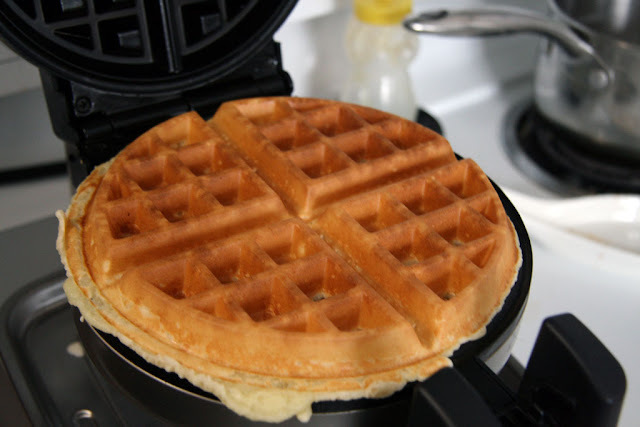 Yet they managed to make some crazy delicious items with just one industrial oven! Yes those are delicious! I made some dark chocolate ones the other day! Amazing what icing sugar and egg white can do! I love Paris! I need to go back soon!! Which places did you go visit last time? oooh that sounds amazing! Bakeries always have that effect on me too! Do you remember the name of the one on Salt Spring Island? Yes! I love when I walk into a bakery and inhale the amazing smells. Yes! those macarons are one of the main reasons why I started making them myself at home! The hot chocolate is always an amazing treat especially on cold days! What are your favourite treats from Duchess? Yes! Definitely "taste test"at Duchess and let me know what you tried there! Good luck on winning, but if not the cookbook is available in store or you can buy it online at Provisions. Hi Rachel! Yes, I definitely need to visit Tartine the next time I am in SFO. I have their Tartine Bread book and have made a few recipes from there. Not the same as trying the real thing though! I bought mine the first day it was available, but would love to win one to give my girlfriend for Christmas! I love my memory of going into the patesseries in Paris.